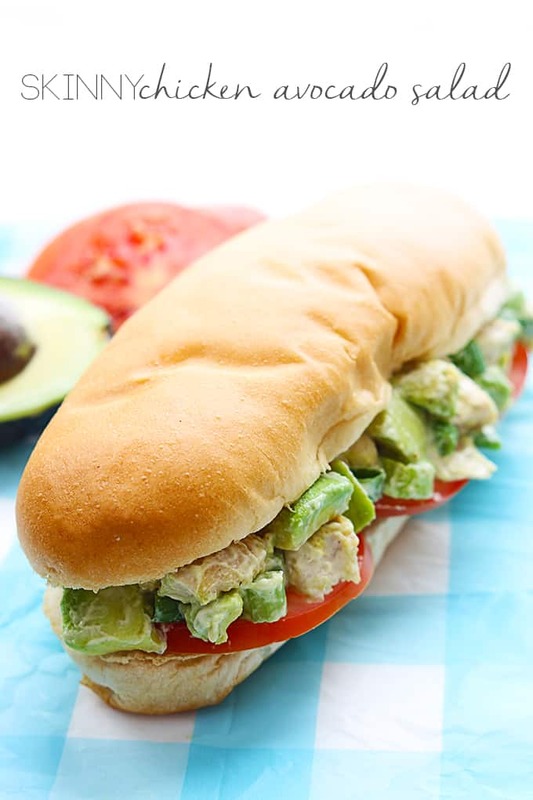 This creamy chicken avocado salad sandwich is so packed with yummy flavor you would never guess it’s actually healthy! Blogging Day 366: a sandwich.You’d think after a year of blogging and cooking full time I’d be sharing things like poached eggs with hollandaise sauce or something elegant like that. Nope. 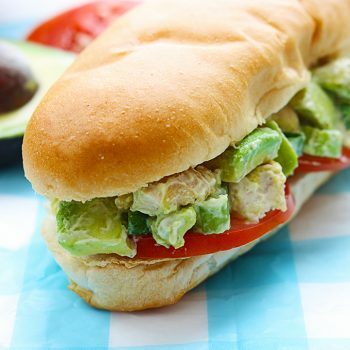 Just keepin’ it real around here with a skinny chicken avocado salad on a hoagie roll. Yeah. . . we’re classy like that. This sandwich may not look like much but it is sooooooo delish, you will be looking for any excuse to make it. My husband has asked me to make it twice in the past two weeks and just said the other day, “So those sandwiches, they aren’t real hard to make right? Cause I’m probably gonna want it again soon…” There you have it. From Mister Business Casual himself (aka MBC, aka my good lookin hubbs). And I just have to mention, he is not a cold-cut sandwich guy. It always has to be hot with melty cheese, or toasty grilled. But this chicken avocado sandwich is served chilled or at room temp and he loooooves it. So it’s gotta be good right? 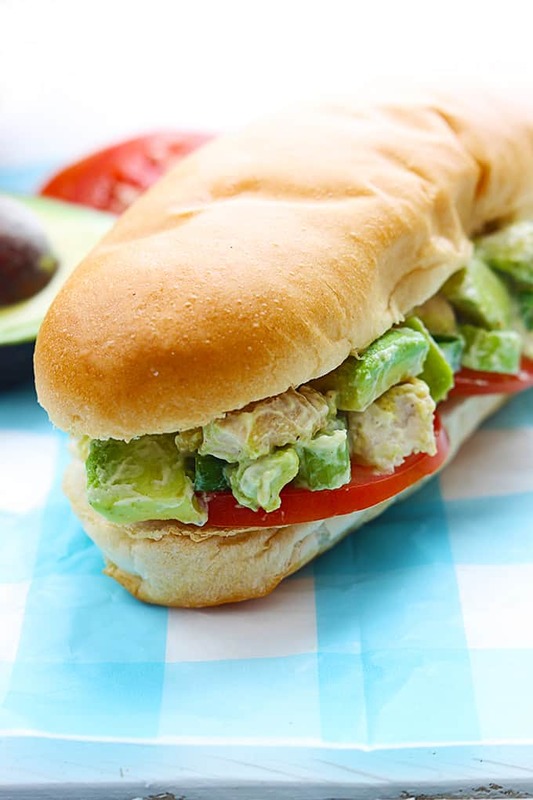 This creamy chicken avocado salad sandwich is so packed with yummy flavor you would never guess it's actually healthy! Add garlic powder, seasoning salt, sugar, dijon mustard, mayo, and greek yogurt to a medium bowl. Stir to combine. 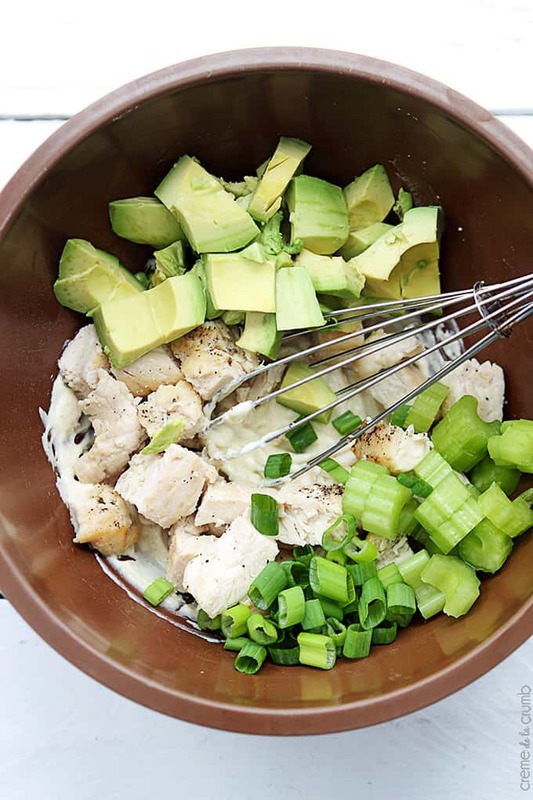 *The chicken salad mixture can be made ahead of time by storing covered in the fridge WITHOUT the avocados. When ready to serve, stir in the avocados and assemble sandwiches. More Lunch Recipes in a Hurry! Looks gorgeous Tiffany! Could totally go for some chicken salad right now. Pinning. You can never have enough chicken salad in your life! Love all the avocado in this one! Looks like the perfect filling for a wrap, too. I’m always looking for something good to throw in besides deli meat. Trying it this week! Made this for dinner time tonight. Used drumsticks instead of breasts. Used spicy brown mustard instead of Dijon. Was delicious! Thanks for sharing. This is so yummy and flavorful! We loved everything about it and I will definitely make it again! I Made this for The family and it was a great hit. I sauteed the CHICKen after adding salt pepper and poultry seasoning. It tasted like roasted chicken. Question my kids And husband want THis for their lunch. Does anyone know if I add lemon to the dish if it would hold the AVOCADOs? This took me an hour to get down which would MEAN not enough time. I think mixing the avocados in the mixture made a big difference in making the dish so creamy that i think adding it last would have a different result. Yeah for sure! Some fresh lemon juice would help the avocados stay green. Be sure to wrap the sandwich tightly with plastic wrap before putting in a plastic bag. Or you could even put the salad in a container by itself not on the bread! Let them assemble themselves so it’s definitely fresh! I am super excited that you and your family loved this recipe!! Thanks for your feedback, Jess!